A gold price of $5,000 is still three to four years away, said McEwen, who’s chairman and chief owner of gold-focused McEwen Mining. Where is the gold price headed in 2018? 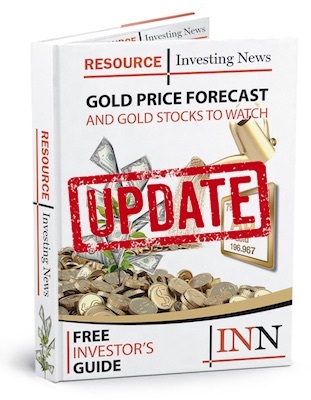 Rob McEwen, chairman and chief owner at McEwen Mining (TSX:MUX,NYSE:MUX), believes the yellow metal is headed higher. McEwen also shared his thoughts on this year’s #DisruptMining competition. Held during PDAC, the event saw four finalists engage in a “Shark Tank”-style competition for a chance at an investment of up to $1 million, or for a proof of concept at one of Goldcorp’s (TSX:G,NYSE:GG) mines. Watch the video above for more insight from McEwen on the future of gold and technology in the mining space. You can also read the transcript below or click here for our PDAC playlist. INN: We’re here at PDAC, it’s the second day of the conference. I believe last night you were a judge at this year’s #DisruptMining competition. I wondered if you could start by telling me about that event and its goals. RM: Everyone should go to it. Just open your mind to new technologies. This year was a — it was quite a glamorous affair, it was in a club, and there were many hundreds of people. There were four finalists dealing with … alternatives to cyanide, to hitting the Earth with sound waves to see the stratigraphy, to trading and cutting down your costs and graphical interfaces that interplay with the gaming industry. So it’s starting to make mining look fun. INN: Who was the winner of the event yesterday? RM: It was a company called Acoustic Zoom, and they send a sound wave down into the ground around a bore hole, and they claim they can go out 200 meters from the hole and give a very, very detailed image of what the geology is like. So you should be able to find deposits faster. And not only is it going 200 meters one way, it’s 200 meters all the way around. Think of it like a layer cake going down, you can just look at each one of these areas. I think it could transform mining. Maybe speed up the definition of geology, and maybe a deposit that’s worthy of a lot of attention. INN: Thanks for explaining. We spoke earlier this year, and when we spoke you said you thought we’re at or near the bottom of a commodities price cycle. For your company, McEwen Mining, what are you doing at this stage in the cycle? RM: Since we’re at the bottom, it’s a time when you want to be buying — buying or building. And we got a permit in November of last year to start building in Nevada, so we’re building an open-pit heap leach mine there. And that will be constructed this year and in operation next year. It’s about 40 miles south of Barrick Gold’s (TSX:ABX,NYSE:ABX) biggest gold mine in the world. So it’s in the right neighborhood. Last October, we bought a mine in Timmins called the Black Fox mine. We’re spending this year US$11.5 million on exploration. Six months before we bought it, we bought some other properties in Timmins, and the Black Fox mine has a mill with excess capacity, so we’re going to process the ore there. We’re quite opportunistic, looking around and saying, “how can we add mass?” Because our ultimate goal is to get into the S&P 500 (INDEXSP:.INX). In order to do that, we have to be a bigger company, and the one governing constraint on the growth is my interest in the company. I own 24 percent of the company, and I have $130 million invested there … and I get a dollar a year. Making a bigger company isn’t important to me if we don’t get a better share price. So that’s the one governor. A lot of people expand and they forget about the share price and shareholders, that they want a higher price too. INN: And you prefer distressed assets, correct? RM: Exactly. Problems that are sitting out there, they’re like a puzzle and you want to solve it. Sometimes it takes longer to solve and the market can grow impatient, but that’s where you create the real value. But I do think we’re in a period right now — we’ve rounded the bottom, and when you start off the bottom it’s slow to pick up speed. I think, barring a major political battle or war, I think we’re looking at 10 to 15 years of stronger markets for all commodities, including metal. I think gold particularly, given all the reasons that are out there — the large monetary expansion, the huge amounts of debt that have been incurred — are all reasons to think that gold’s going to come into its fore. We’re at a 46-year low of commodity prices relative to equities, so there’s that. And if you look at the gold market per se, you go back 77 years, there’s been eight bear markets. The last bear market we were in I’d say ended in January of 2016, and it was one of the longest bear markets and one of the deepest. So if you say from January last year to present, that was the start of the bull market. There’d been six previous bull markets and they’ve gone up from where we are today. They’ve gone up a minimum of 600 percent. So 75 percent of those prior periods went up 75 percent. We’re up about 200 percent from our bottom, so that would suggest there’s a 75-percent probability that we’re going to get a threefold increase in values from here. So I’m quite optimistic. INN: You’re well known for your call for $5,000 gold. You’ve laid out before how that would happen. Is there anything you would add to help investors understand where that’s coming from? RM: Sure. When gold was broken free from its link with the US dollar back in ’71, it was just around $40 an ounce. And by the end of the decade, the beginning of ’80, it was over $800. So there’s a twentyfold increase from the bottom to the top. If we use the bottom that we had in 2001 as the base, that was $250, you apply a 20-times multiple on that, you’re at $5,000. INN: I think that helps it make sense. RM: So there’s the math. INN: There you go. That’s I think quite a long-term type of prediction. RM: Do you think so? INN: I don’t know, you tell me. I was going to ask you for your short-term price prediction. Maybe you can lay out the timeline for me? RM: There’s a battle going on right now. Interest rates going up in the US and the dollar strengthening, but the government down there wants it lower. And so it’s going back and forth, and investors are saying, “well if interest rates go up, gold’s going to go down because the dollar’s going to go up.” And gold is quoted in dollar terms. But often you’ve seen periods where both interest rates and gold are going up at the same time. So where we going this year? We’ll be higher than we are today. I’d like to see it try to take a run at $2,000. The last time it was 2011, and it just got close to where I wanted it to be and then it fell over, it got to $1,920 and then rolled backwards. I think $1,800, maybe a little better than that. And $5,000’s three, four years down the road. INN: Alright, we’ll hold you to it. Let’s end on your company. You’ve already told us what you’re up to, but tell me for investors who may not be as familiar with the company, what’s the case for investing in McEwen Mining right now? RM: Alright, well first, we’re very liquid traders, so if you get in you can get out easily. Most of our trades are in the New York Stock Exchange, about 95 percent. We’re one of — if you believe being in an index is a valuable characteristic of a company, we’re in about 36 indexes. Our goal is to get into the S&P 500, and there’s only one gold stock in there. And if you want to just think for a moment how underowned gold is. According to Bloomberg, there is $31 trillion of market capitalization in all the publicly listed companies in the US. Eighty percent of that is represented by the companies in the S&P 500, so that’s just under $25 trillion. Then you’ve got Newmont Mining (NYSE:NEM) being the only gold stock, and it’s $25 billion, not trillion. So expressed as a percentage of the S&P it’s eight one-hundredths of 1 percent. That’s very underowned. If we were to go to a 1-percent weighting in the portfolio being in gold, we’d need 11 additional Newmonts — that’s $220 billion of additional money coming into gold. So I think you want to be in an index. You want to be large enough to be an index. If you’re lucky enough to be able to qualify for an index such as the S&P, and 99 percent of all the public companies, producers can’t get into it. We’re one that can by virtue of where we’re incorporated, that being Colorado. We have $60 million in cash. We don’t have any debt. We don’t sell metal streams. We don’t sell royalties. We don’t hedge your production, so therefore we keep all the upside for our shareholders. If you’re buying a gold stock, you’re not buying it to sit on it. You’re wanting to see it climb. And companies that sell streams and hedges and royalties I think are sacrificing the upside in their revenue stream. Ownership, as I said earlier, I get a dollar a year, and I’ve elected not to take any bonuses and options. So growing and getting a bonus isn’t part of my gain, if you like that corporate governance side. As I said earlier, I’m the largest investor with $130 million cost. We have diversified production — we’re in Argentina, Mexico, building in Nevada, in Canada. You have this diversified picture with some aggressive growth plans. With a governor on it that — I’m not going to expand the shares that quickly because I want a higher share price. For a guy that smart, McEwen keeps stating this nonsense about $5,000 for gold, and the “math” behind it is completely unrealistic and out of context. Sounds like a second hand care sales man although he is a legend in the industry.